The City of Chico Fire Department and Chico Firefighters, Local 2734 are saddened to announce the passing of one of their own in the line of duty. 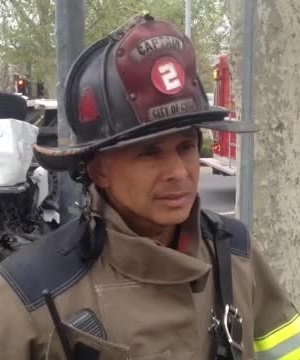 Captain Ruben Joseph Duran, lovingly known as Joe, passed away on September 12, 2018 following a battle with job-related cancer. Brother Duran spent nearly three decades as a firefighter with the City of Chico, rising to the rank of Captain and serving as the leader of the department’s Fire Rescue Team. Brother Duran was a valued member of the City of Chico Fire Department and served his community with honor and distinction until his health forced him to retire in August of 2017. He passed away following a long battle with job-related stomach cancer. Services for Brother Duran Friday, September 21, 2018 at 11:30 A.M. at the Bidwell Presbyterian Church in Chico (208 W 1st, Chico, CA 95928). All departmental and local union honor guards are encouraged to participate in the memorial services for Brother Duran. Honor guard personnel are asked to RSVP as soon as possible to Ben Dominguez of the California Fire Foundation’s Last Alarm Service Team (Cal LAST) at either (916) 709-9069 or bendoverfire@yahoo.com. All personnel who plan to attend in a fire apparatus, please contact Division Chief Jesse Alexander at (530) 588-2823. Apparatus are asked to stage at the church by 9:30 A.M.
For additional information and updates, visit www.cafirefoundation.org.